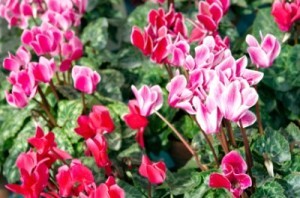 Cyclamen is a very popular flower to have during the winter months. It is grown as a houseplant in the winter. They also grow in the fall through the spring outdoors. When growing them outdoors, they grow best in shady spots. First we will talk about the popular winter houseplant, then the outdoor species. 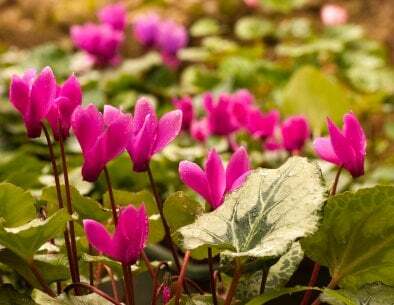 If you are growing Cyclamen, they grow from tubers in late fall or winter. They like the cooler temperatures in a house: around 55 – 60 degrees. They love the sun but cannot be placed in direct sunlight. They need to be given an all-purpose liquid fertilizer about every other week. The soil should be moist, but not drenched. If you place the plant on a pebble tray, they will grow very well. Once the flowers begin to bloom, the flowers have a waxy look to them. They have a star like shape and grow in wonderful shades of pinks, reds and white. The dark, green leaves grow below the flower and arch back slightly. This really is a lovely plant. Now, growing this plant in the other seasons outdoors is a little different. They also come in tubers, and you want to plant them in the summer. Plant them in an organic potting soil mix to promote healthy growth. You also have to make sure that they soil has good drainage, so that the roots do not rot. Set the tubers about an inch below the soil, and sprinkle pieces of leaves on top. In the autumn when the plants finally begin to bloom, star shaped blooms fill the fields. Such wonderful colors of pinks, roses and white grow all around. The leaves are a luscious, darker green that are shaped like delicate hearts. Everything about this plant screams dainty and delicate. The plants will grow through the winter and in the spring or summer months, the plants will go dormant. When the plant is in full bloom it resembles a shrub. Just don’t forget to grow it in the shade, and you will have a wondrous winter flower.